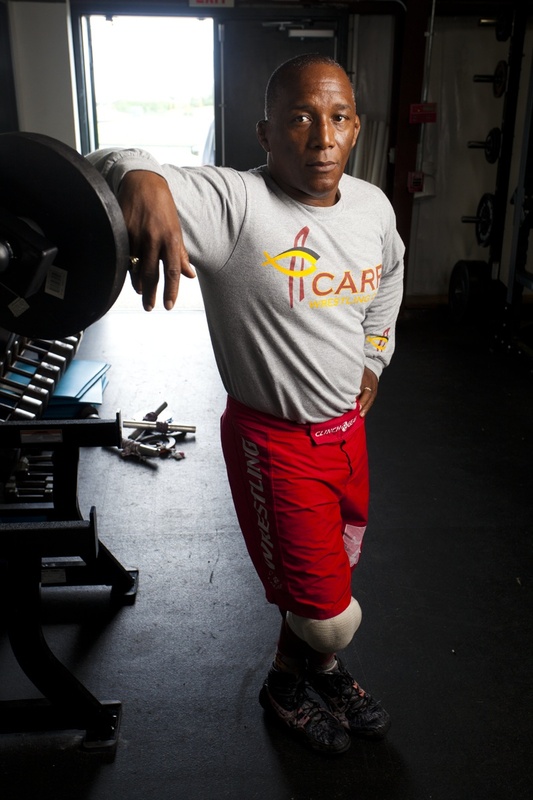 Nate Carr (’85 sociology) grew up in a big family with big dreams. Nate was the eleventh of 16 children (he jokes that his parents embraced the notion of “be fruitful and multiply,” and he’s grateful they didn’t stop after having 10 kids.) Five of those kids, including Nate, became All-American wrestlers (an NCAA record), and two competed in the Olympics. As a wrestler for Iowa State, Nate won three individual national championships (1981-83). He won a bronze medal at the 1988 Seoul, Korea, Olympics, outscoring his opponents 67-7. He was inducted into Iowa State’s Athletics Hall of Fame in 2000. Nate’s wrestling career has continued, as an assistant wrestling coach at West Virginia University, as head of youth wrestling at Team Prodigy, as a wrestling coach at Jones County, Ga., High School, and at camps and clinics across the country. He currently manages, with his wife, Linda, his own wrestling clinic, Carr Wrestling Club near their home in Centerville, Ohio. Their oldest son, Nate Jr., was an outstanding wrestler at Iowa State. Nate joined the ministry when his family lived in Georgia, and he draws parallels between being a pastor and being a coach. “My life’s mission is to produce champions in this life and for all eternity,” he says. He worked with inmates as a prison minister and has spent much of his career working with youth. He performed the weddings of many of his athletes. “I always threatened them that if they didn’t act right, I could put them in a headlock,” he jokes. Nate continues to stay in shape – he rides his bike and lifts weights every morning – and to minister to young athletes at every opportunity. With 40 states completed, the travel portion of VISIONS Across America is winding down. Except that it doesn’t feel winding-downish at all. It feels chaotic and stressful. And breathless and fun and exciting. Because the travel to our last few states in August and September is going to be packed crazy-tight. It’s always nice to come back from one trip and have a little time before the next one. But right now I’m working on the next three trips all at the same time. We’re flying off in a week to Seattle, Wash., our jumping-off place for four states: Washington, Oregon, Idaho, and Montana. That’s a lot of land to cover, but we’re really excited about this trip. We’ll be in two national parks (Olympia and Glacier), driving through some spectacular parts of the country, and visiting some of the greatest cities in the Northwest as we meet with alumni in each state. We’ll be back in Iowa for a couple of weeks before heading off for a quick and easy driving trip to Missouri and Kansas. And then we’ll be in our offices for just one week before starting our last major travel: Wyoming, Colorado, and Utah. Talk about saving some of the best states for last: This will be another drive through beautiful national parks and great American countryside. We have some great alumni lined up for this trip, too. After we return from that trip at the end of September, we’ll have 49 states complete. Guess which state will be left? I’ve talked to lots of people during this VISIONS Across America project, and they’ve asked a lot of questions about our process and logistics. They’ve asked about flying vs. driving (driving is simpler but obviously takes more time), whether Jim and I get along when we travel (mostly yes), and how we select the alumni we feature (I have a long answer for that one, because it’s complicated). Who are you going to feature in Iowa? I STILL don’t have an answer to the last question, and we’re getting down to the wire. More than 90,000 Iowa State alumni currently live in the state of Iowa. That makes Iowa both the easiest and the most difficult state to choose. I’ve received a lot of suggestions and nominations and advice…but most people just say, wow, that’s gonna be a tough one. Something magical happens when Donald Somers picks up a banjo. Don (’58 ag journalism) first played the banjo in 1978 when he was married to a folk singer. 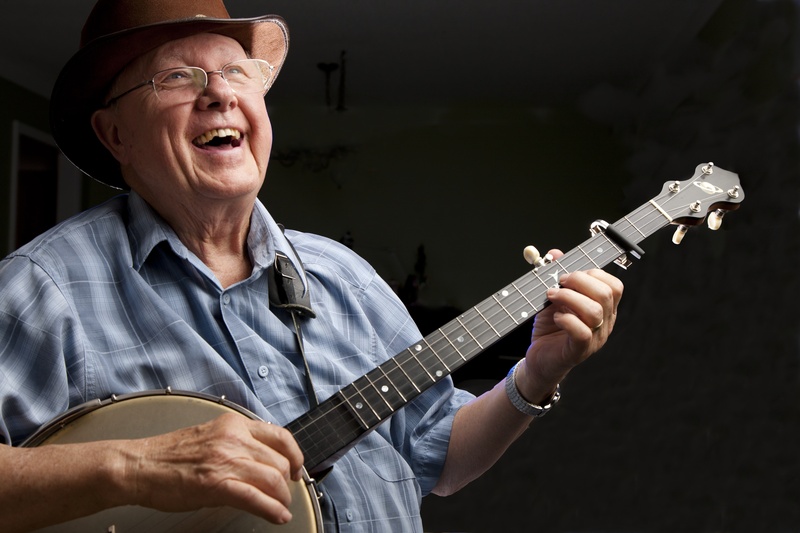 Don and his wife split up, but he maintained his passion for the banjo. In 1996 Don married his current wife, Sylvia Maiuri, a professional pianist and piano teacher, and moved to Indianapolis. He also changed musical directions, switching from the bluegrass style of play to the old-time clawhammer style. The style gets its name from the way you hold your hand, Don explains. It’s also called hammering, flailing, or thumping. Don plays in regular jam sessions every Monday night in Bloomington, Ind., sometimes with as many as 13 musicians. “The size of the room limits the size of the jam,” Don says. For his “day job,” Don spent 38 years with the Brady Company in Milwaukee, starting as copywriter and working his way up to creative director, vice president, senior vice president, account supervisor, and board of directors. He began a phased retirement in 1996 and retired completely to a life of banjo in 2000.